This is the first of many daily logs that I'll make via my iPhone so excuse the spelling and formatting. The day started with an earlier than expected wakeup for a Sunday. Spirits are high. Mari Lu can't wait to get going. Juan is leaving earlier than us for a scout outing. 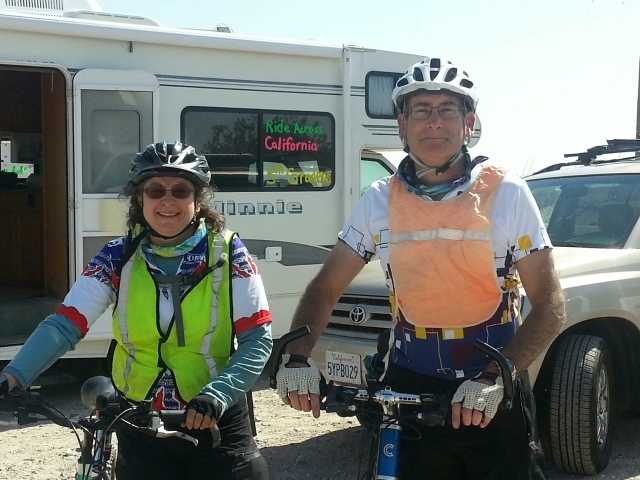 He'll be taking a canoe down the Colorado river for five days while Jeanette, ML and I ride across California for six days on our bikes. 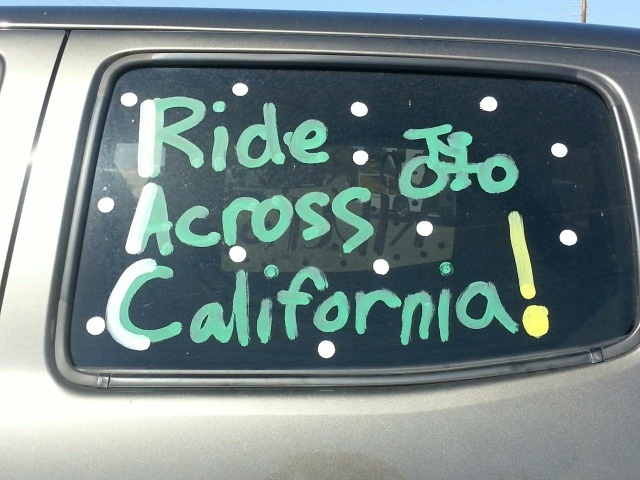 Ride Across California (known as RAC here forward) is organized by the YMCA and Gary Rossi. RAC was started years ago by a teacher for fifth graders to build confidence as they get ready to start middle school next year. Mari Lu has been training for this for 3 months. 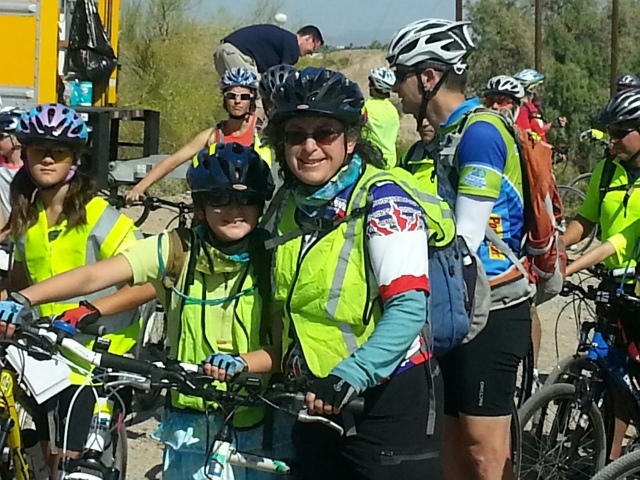 The ride starts just west of Yuma AZ. where we dip our back tire in in the Colorado river and ends when we dip our front tire in the Pacific Ocean near Carlsbad Ca. 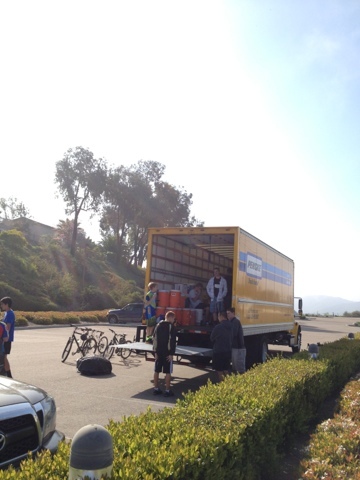 We left San Diego at 1130 after dropping off everything not cycling related to be carted to the first camp site for us in a large Penske truck. 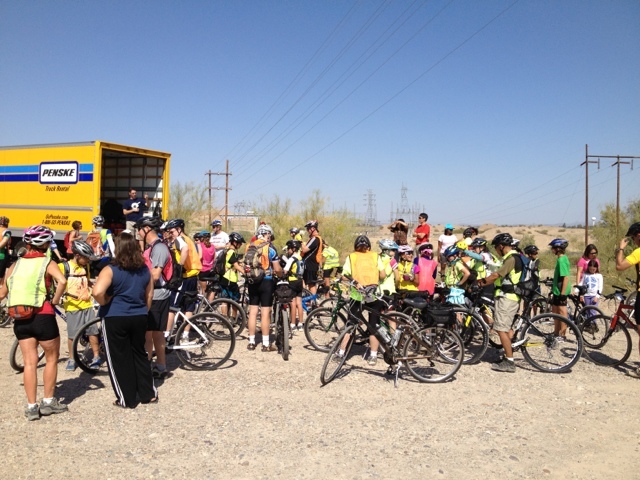 We are with about 100 other cyclists and approximately 40 support drivers helping with water stops, snacks lunch, etc. 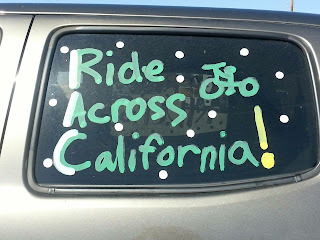 Traci and Mike West drove us to Yuma Az. The trip was uneventful and included a stop at Subway for lunch, Mari Lu's favorite. After arrival, at the rally point, the kids are going crazy with excitement. 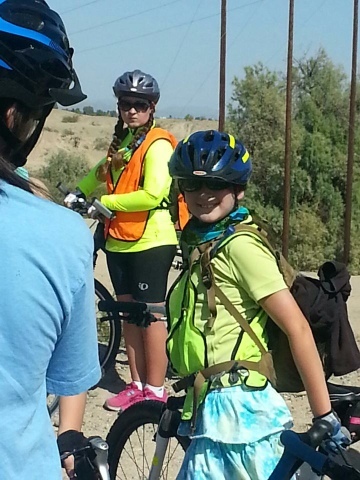 We get pictures of us dipping the back tire in the Colorado and then hit the road at about 1500. 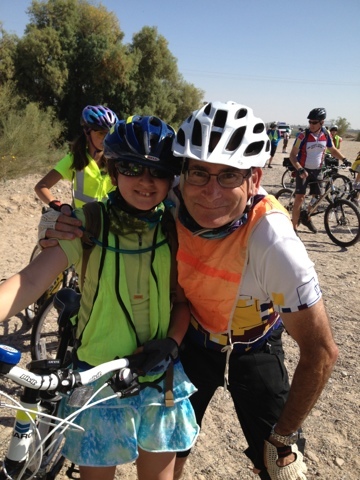 About a mile into the ride today we are on a dirt road with lots of river sand. There's a Toyota mini-van belong to a chase driver stuck in the sand. After a few attempts to get it unstuck and a lot of talking about what to do because it's up to the frame so it's high centered and going no where. I got the drivers jack out and went to work. I got it high enough to start putting stuff under the tire, make some progress till the jack and slid enough to necessitate a redo on the jack. After putting a board we found partly under the front tire I got behind the drivers seat with four guys pushing. It came right out. Now I'm tapped out, it's a cool 79 degrees, I've jacked this car up twice an I've got 18 miles left to ride ( it's a short day). I added to this by attempting to ride through the sand and... fell over like a wounded animal. After screaming for a medic and laughing I was up and going again to try to pace myself back to the peloton, who should be an hour in front of me ( if you don't count breaks :) ). I put some tunes on and caught up to ML and Jeanette about 15 miles up the road. They were taking a break. ML was a little worn out withe the wind coming stait at us at about 5 kts. The heat wasn't helping either. I think I finished off 4 bottles of water to this point. I took MLs camelback and put it on and we head out, giving Jeanette a break. I was trying to Mari Lu to ride my wheel so that I can break the wind for her. I'm not sure she got it. We took a few breaks and all went well. When we were a mile from camp, ML was like a dude ranch horse that smelled the corrals, she flew down the road. Arrival was at about 1745. Tents pitched, it was time for dinner. We had pizza and punch. There was a camp fire and ML couldn't wait for the ghost stories. I got in line for a shower since I felt a bit grimy after getting in the dirt to jack the car up earlier. I missed the stories but ML wasn't too impressed. She took her ghost story book out and read some to Jeanette and then another one to me. We talked about our day and called it a night. Right now Mari Lu is snoring away on one side of me and Jeanette on the other. Too funny. What a fabulous first day! Ride on cowboy's.